Description: Set during the Civil War, against a backdrop of grand estates, unimaginable riches, and deadly secrets, three teenagers in Mystic Falls, Virginia enter a torrid love triangle that will span eternity. 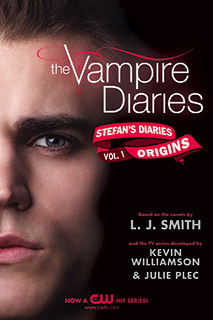 My thoughts: When I first heard about the Stefan's Diaries I got really excited. Stefan is one of my favorite characters from the series. I also liked that Kevin and Julie were involved too. I feel like I've gotten more answers from the show than I did with Smith's original series, even though I did still enjoy it. In this book we get to see some of the same scenes that have been in the flashback scenes on the show. We get to see how Stefan and Damon were before they were turned into vampires. If you have enjoyed the show and Smith's original series then you would like this one too. From reading it you can tell that Williamson and Plec were involved. The scenes and language had pretty much the same feel as the show. I have yet to read the Vampire Diaries books but I am in love with the show. I'm hoping to pick them up sometime soon. Great review! I have this book on my shelf. Looking forward to reading all of these Vampire Diaries books!